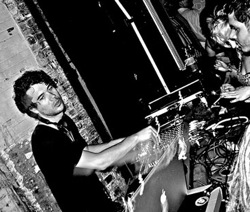 Someone Stole Matthew Dear’s Hard Drive While He Was Playing? Yo! Earth to useless hipster: this is New York. We used to have real crime here, not you jacking someone’s external FireWire box. Jeez. I’m a little late on this — the crime took place April 4 at Galapagos’ Bunker party (formerly at Tonic). Some jerk in comments on DTD says, "Who cares hwo mucgh creativity is therein blippy tracks that lst 45 minutes." [sic] Aside from Pete’s complete inability to spell the easiest words in the English language, he’s risking some major bad karma by writing that — well, unless he plays with theft-proof wax cylinders, that is. For reasons that escape me, this whole incident sends the Brooklyn Vegan rock-loving crowd into a frenzy of anti-computer, pro-guitar rhetoric. Yes, that must be it — God Himself took Matthew’s hard drive, because playing music out of computers is the Devil’s work. The classic “FireWire Smite” move.